This B2B ecommerce company found success when they found a way to leverage data that increased departmental participation in cross-functional projects. Delivering the right content at the right time based on an understanding of customer trends, behavior and preferences. Implementing the Search Experience Optimization methodology and seoClarity. Identifying and resolving problematic technical elements, then pushing out the data delivered by real-time reporting to gain a holistic view of the entire search landscape. 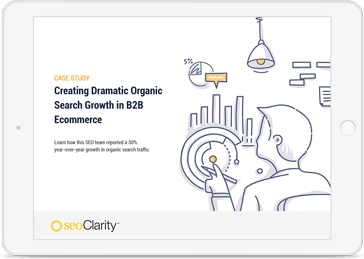 Reporting 30% year-over-year growth in organic search traffic. Through a committed effort to the Search Experience methodology, our cross-functional teams recognized the benefit of working together to apply SEO insights. As a result, we've achieved 30% year-over-year SEO growth.